In a comment on my blog post about the alleged “gas chamber” at Natzweiler-Struthof concentration camp in the French province of Alsace, this statement was written: “… Carlo Mattogno had conceded in his November 2011 book that the Nazis gassed Jews at Natzweiler-Struthof…” If you don’t know who Carlo Mattogno is, stop reading this right now and go to the Inconvenient History blog, where you can read his articles about the Holocaust. Carlo Mattogno is the foremost revisionist scholar; if he says that people were “gassed” at Natzweiler, it must be true. But…it depends on what Mattogno means by the term “gassed.” Does he mean “gassed” as in put to death, using poison gas, in a chamber like the one that was formerly used in Jefferson City, MO to execute criminals? I don’t think so. I visited the Natzweiler-Struthof Memorial Site in 2004 and wrote about the “gas chamber” on my website here. The building shown in the old black and white photo above, which is about a mile from the former camp, was not open when I was there in 2004. At the Nuremberg International Military Tribunal, charges were brought by the American prosecutor against the Nazis for medical experiments performed at Natzweiler, but there were no documents introduced in which it was claimed that a gas chamber had been used there to murder Jews. The abandoned Natzweiler camp was discovered by both French and American troops, so it was the responsibility of the French and the American prosecutors to introduce the evidence of the gas chamber there. Kirk and Gully wrote a report that was sent to the War Crimes Division, in which they referred to a “so-called gas chamber” at Natzweiler. Based on their report, there were no charges, pertaining to a gas chamber at Natzweiler, brought against the Nazis on trial before the International Military Tribunal at Nuremberg. 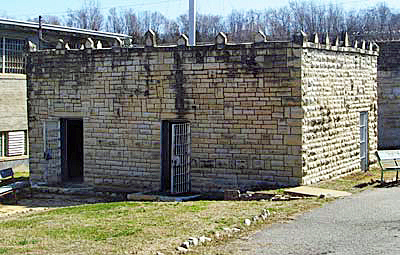 The “so-called lethal gas chamber” that Kirk and Gully mentioned in their report was in the building shown in the photo below. What Kirk and Gully saw was the shower room that is located next to the one cremation oven. The outside wall of this shower room is what is shown in Judisman’s painting. Yishai Jusidman based his painting on the photo below, which he modified, to make it look like the inside of a gas chamber. When I visited the Natzweiler Memorial Site in October 2004, the room next to the cremation oven was not open to visitors. I peeked through the window shown in the photo above and saw what looked like a shower room. This is probably the “so-called lethal gas chamber” which the two American officers described in their report, but there was no sign on the wall which said that this was a gas chamber. 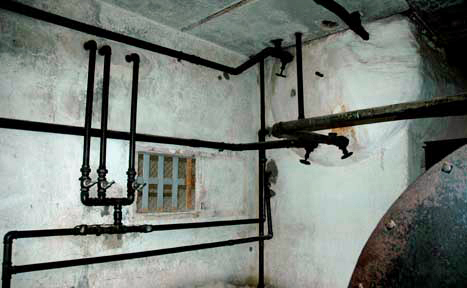 The shower room is not the room that Josef Kramer, the former Commandant of Natzweiler, described in his confession to the British after he was arrested at Bergen-Belsen, where he was the last Commandant of that camp; Kramer described a room in the building that is located about a mile from the camp. 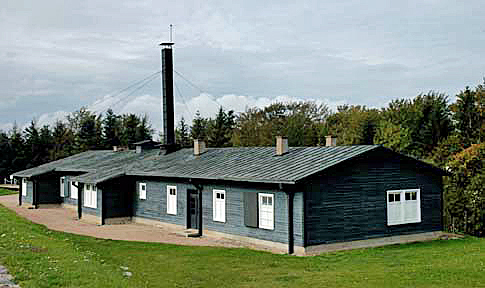 Le Struthof, as the camp is known to the French, was located 31 miles from Strasbourg where Dr. August Hirt, a Professor at the University of Strasbourg, was conducting research on racial characteristics. When he requested Jewish skeletons that were undamaged by bullet holes or body blows, Heinrich Himmler ordered that Jews should be brought from Auschwitz to Natzweiler so that they could be killed in a gas chamber there. 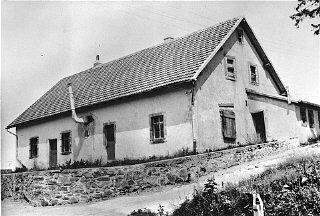 In August 1943, a special gas chamber was constructed by adapting an existing building, formerly owned by the Struthof hotel, which was located about a mile from the concentration camp on a side road. This room had previously been used as a refrigerator room by the hotel. Killing the Jews in one of the gas chambers at Auschwitz and shipping the skeletons to Strasbourg wouldn’t do – the skeletons had to be prepared with great care by Dr. Hirt himself. According to a Tübingen Professor, Dr. Hans-Joachim Lang, two anthropologists, who were both members of the SS, Dr. Hans Fleischhacker and Bruno Beger, were sent in June 1943 to Auschwitz to select Jews to be gassed so that their skeletons could be added to the rassistische/rassenideologische collection of Dr. August Hirt. There were 57 men and 29 women in the group that was selected. In the documents submitted to the Nuremberg International Military Tribunal, it is mentioned that the Jewish victims were put into quarantine for a time at Auschwitz because there was a typhus epidemic in the camp; then they were brought to Natzweiler-Struthof. The Nuremberg IMT documents show that 86 corpses were brought to the Anatomie Institute of the Reichsuniversitat Strassburg and that an assistant of Prof. August Hirt saw the tattoos on the arms and secretly wrote down the 86 numbers on a piece of paper. In the museum at Natzweiler-Struthof, Josef Kramer’s confession, regarding the gas chamber, is on display. In his confession, Kramer described how he personally mixed “salts” with water to produce a lethal gas. The gas was dumped through a hole which had been chiseled through the tiled wall of a room previously used for the refrigeration of perishable food. Then Kramer watched through a peephole as the Jews died from the fumes of the poison gas. Josef Kramer was convicted by a British Military Tribunal held in 1945, and hanged for the crimes he had committed at Auschwitz II and Bergen-Belsen. The charges against Kramer at the proceedings of the British Military Tribunal did not include the crime of gassing Jews at Natzweiler-Struthof. Rather, he was charged with crimes committed at Bergen-Belsen and with gassing Jews at Auschwitz, where he was the Commandant of the Auschwitz II camp before being transferred to Bergen-Belsen in December 1944. At the Nuremberg International Military Tribunal, charges were brought by the American prosecutor against the Nazis for medical experiments performed at Natzweiler, but there were no documents introduced in which it was claimed that a gas chamber had been used there to murder Jews. The abandoned Natzweiler camp was discovered by both French and American troops, so it was the responsibility of the French and the American prosecutors to introduce the evidence of the gas chamber there. In 1989, a plaque was placed at Struthof, in memory of the “87 Jews who were gassed” there. This was accomplished through the joint efforts of the Simon Wiesenthal Center and a New Jersey lawyer, Stephen Draisin. The number 87 includes the 86 Jews who were brought from Auschwitz to be gassed and one Jewish inmate who died during the same time period. Hirt, professor of anatomy in Strasbourg, received corpses from the camp of Russian war prisoners at Mutzig, but as he thought they were too lean, he asked for people in a good physical condition for studies on heredity. 87 Israelites (30 of whom were women) were sent from the camp at Auschwitz. They were shut up in block 13 at the Struthof where they were measured, and they had to undergo experiments on sterilization. On August 11, 13, 17, 19, 1943, under the direction of doctors from Strasburg, the S.S. gassed the 87 Israelites in the gas chamber at Struthof with cyanide. Death occurred after 30 to 60 seconds. The corpses were transported to the Institut d’Anatomie in Strasburg. 17 entire corpses (3 of which being women’s) were found at the liberation as well as many dissected pieces. According to Dr. Hans-Joachim Lang, there were 16 of the 86 bodies (3 women and 13 men) that were found intact in November 1944, not 17, and an autopsy was performed on the bodies. Dr. Lang was able to identify the 86 Jews who were gassed at Natzweiler after locating their prisoner numbers in the Auschwitz archives. The 29 women and 57 men who were gassed had been deported to Auschwitz from Norway, Poland, Greece, France, Germany, Belgium and the Netherlands. The bodies of the 86 victims were buried in the Jewish cemetery of Strasbourg and a grave stone with the 86 names was placed there in December 2005. An air raid shelter of the fugger dynasty in Augsburg with the word “Gas” on the massive door.The shelter was public and maybe that’s the reason why there’s not another “homicidal gas chamber” in town. If anyone was gassed at Natzweiler, then where is the evidence? The evidence was the 86 dead bodies, that were delivered to Dr. Hirt, with no bullet holes or damaged bones. They had been killed by some means that did not damage their skeletons. Natzweiler was a camp for political prisoners, who were not tattooed. The dead bodies were the bodies of prisoners who had been brought from Auschwitz, as shown by the fact that they had their ID numbers tattooed on their bodies. They had been killed by some kind of poison. How do we know they were not killed with lethal injections? They could have been killed by lethal injection. No one knows how they were killed. All we know for sure is that the skeletons were undamaged. At autopsy no cyanide was found in the bodies. Considering they punished SS men for misbehaving against prisoners, I hesitate to think they would cruelly kill innocent prisoners like this. The evidence seems too weak to conclude the persons in question were gassed to death. I would be very interested in knowing why Mattogno feel this gassing is a fact. I think that something might have been lost in translation. The word “gas” can have many meanings, such the gas that you put in your car, or a gas stove for cooking, or poison gas such as serin gas. Mattogno could have meant that he agrees that some prisoners, who were brought to Natzweiler, were killed with poison. I don’t think that anyone was killed in a “gas chamber” at Natzweiler because such a thing did not exist there. I tried to get permission to see the “gas chamber” at Natzweiler before I went there, but my request was denied. The staff at the Natzweiler Memorial Site does not want anyone to see the alleged gas chamber because it was not a gas chamber. In 1945 Pr René Fabre, Dean of the Pharmacology Faculty in Paris, was asked to study the alleged Struthof-Natzweiler gas chamber and those 86 corpses. Pr Fabre wrote a report (Dec 1, 1945) and concluded there was no gas chamber at Struthof-Natzweiler and the 86 corpses were not the bodies of people killed with hydrogen cyanide. Naturally the Holocaust lobby later made this study disappear and paid other scientists – Pr Piedelièvre, Pr Simonin and Pr Fourcade – for an anti-revisionist report on Struthof-Natzweiler. In 1979 Pr Faurisson was sued because he had denied there was a gas chamber at Struthof-Natzweiler. Looking for informations for his defense Pr Faurisson found the Piedelièvre-Simonin-Fourcade report in the archives of Meaux. This report naturally concluded there was a gas chamber and gassed bodies at Struthof-Natzweiler but it also quoted the lost Fabre report. Thanks to that finding Pr Faurisson knew about the conclusions of Pr Fabre. Is there any other evidence than the confession of Kramer that this gassing took place ? What gas was used , was it phosgene?? Dr Hirt seems to have ” taken his own life” very conveniently before any trial could take place.. Have you any more information on Dr Lang? befand. Zur gleichen Zeit goss ich eine gewisse Menge Wasser hinein, das wie die Salze in eine Grube fiel, die sich innerhalb der Gaskammer unterhalb des Gucklochs befand. Natzweiler!Thus Kramers testimony is worthless. Of course Dr Hirt could not testify as he was conveniently dead! Kramer was obviously tortured by the British. He was trying to say what they wanted him to say so that the torture would stop. The problem was that he didn’t know anything about how an execution gas chamber worked, so he just made up something. Anything to stop the torture. There is a level of pain which will change the mind of anyone. Most people will never experience this in their lives fortunately.